If you can get a Performance Driven Product like Curlex®, why would you use anything else? 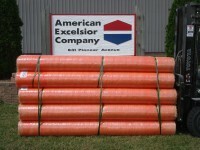 Innovative erosion and sediment control solutions are the norm at American Excelsior Company because our Curlex fibers are the backbone of our products. 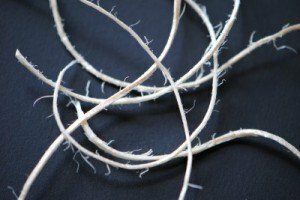 Curlex fibers have a unique ability to expand and contract when wet and when combined with ”barbed” fibers, Curlex CL fibers actually CLing to each other. Project owners, consultants, specifiers, and landscape contractors wish to have many choices when selecting erosion control blankets (ECBs). 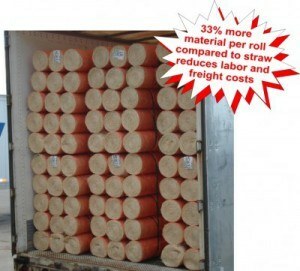 That is why American Excelsior Company, the inventor of biodegradable ECBs, innovated Curlex CL, which is a cost-effective lighter version of standard Curlex that provides performance and vegetation establishment benefits superior to straight lined fiber blankets such as straw. Curlex CL offers the best of both worlds – all the unique benefits of the time proven Curlex fiber and a competitive price. Curlex CL is your new solution for a basic single net and double net ECB applications. Curlex is considered the industry standard by many because of the plethora of Curlex Features and Benefits. Learn more about the differences amongst various fibers used for erosion control. Curlex CL blankets consist of unique softly barbed, interlocking, curled, Aspen excelsior fibers. They are naturally seed-free. Curlex blankets are specifically designed to promote ideal growing conditions for seeds, while simultaneously protecting topsoil from wind and water erosion. Curlex blankets are designed with a built-in swell factor – wet curled excelsior fibers slightly expand in thickness and interlock to form a strong fiber matrix. This allows the fibers to provide intimate contact with the local terrain. Water flow is trained to follow the curled fiber matrix. The roughness of the curled excelsior matrix slows the velocity to a point where gravity takes over, which allows moisture to slowly seep into the topsoil to promote ideal growing conditions. We offer a green color-coded plastic netting for applications requiring UV resistance, strength, and longevity. Our photo-degradable QuickMow™ netting is recommended for urban, golf course, and certain roadside projects. It is color-code white to identify it as a rapid breakdown, polypropylene netting designed for use in areas to be mowed. Watch the Natural Mechanical Functions of Engineered Curlex Fibers. Curlex CL blankets are offered in rolls that are longer than other standard blankets. At a length of 150 feet, 33% more product makes it on each truck, which is imperative with the condition of today’s fuel industry. In addition, labor costs are reduced by expedited installation with longer rolls and because there are fewer seams to deal with. *Weight is based on a dry fiber weight basis at the time of manufacture. 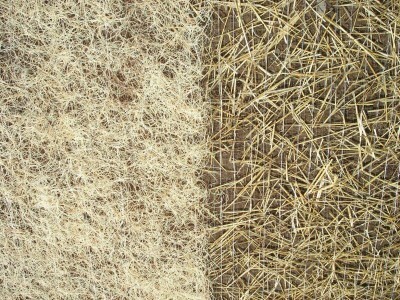 Baseline moisture content of Great Lakes Aspen excelsior and Agricultural Straw are 22% and 15%, respectively. **Longevity varies by region due to differences in climatic conditions. A specific cut of Great Lakes Aspen curled wood excelsior with 80% six-inch fibers or greater fiber length. It shall be of a consistent thickness, with fibers evenly distributed throughout the entire area of the blanket. The material does not contain any seeds or chemical additives. The top of each Curlex I CL shall be covered with netting. The top and bottom of each Curlex II CL shall be covered in netting. **Weight is based on a dry fiber weight basis at time of manufacture. Baseline moisture content of Great Lakes Aspen excelsior is 22%. Curlex CL comes in bright orange wrapping. 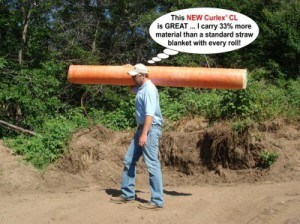 Disclaimer: Curlex CL is a system for erosion control and re-vegetation on slopes and channels. American Excelsior Company (AEC) believes that the information contained herein to be reliable and accurate for use in erosion control and re-vegetation applications. However, since physical conditions vary from job site to job site and even within a given job site, AEC makes no performance guarantees and assumes no obligations or liability for the reliability or accuracy of information contained herein for the results, safety, or suitability of using Curlex CL, or for damages occurring in connection with the installation of any erosion control product whether or not made by AEC or its affiliates, except as separately and specifically made in writing. These specifications are subject to change without notice.